Building on Measure of America’s Disconnected Youth Series, Two Futures: The Economic Case for Keeping Youth on Track finds that by the time they reach their thirties, those who had been working or in school as teens and young adults earn $31,000 more per year and are 45 percent more likely to own a home, 42 percent more likely to be employed, and 52 percent more likely to report excellent or good health than those who had been disconnected as young people. We follow a large group of previously disconnected individuals over time to track their life trajectories approximately five, ten, and fifteen years after their period of youth disconnection. We look at the effects of the duration of disconnection, assessing differences among individuals who were disconnected for one, two, or three or more years. We estimate the future costs of disconnection, both for young people who experience it and to the communities in which they live. 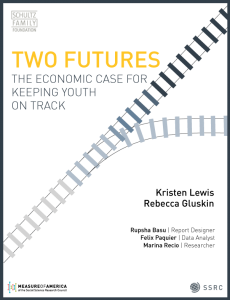 Two Futures: The Economic Case for Keeping Youth on Track (New York, NY: October 9, 2018).